ART DESIGN INTERNATIONAL TACT LOW BACK OFFICE CHAIR|ADI| Alliance Interiors Inc. This is an economical seating solution that compliments any work environment including the home office at a very affordable price. There are many feature to this chair that allow us to order you a custom fit including a discreet lumbar option. 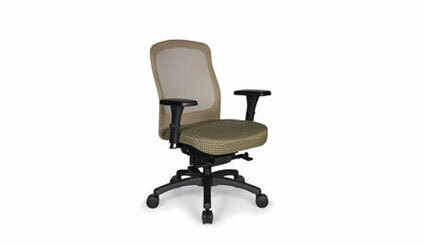 This mesh back ergonomic task chair allows the user to sit in comfort for long periods of time. The low back allow this to be a task chair that can be used on virtually any user that is working at a computer or desk. There is a wide selection of fabrics to choose from and a choice of 60 different mesh back colors. The Tact mesh back side chair is a great companion to this chair and is available on a sled base or on casters.